Product selection tree for the new Ionpure modules. The modules handle high total dissolved solids (TDS) feed water without the consumption or disposal of chemicals. Recognising the importance of recovering and reusing RO reject water, Evoqua's Ionpure ED-R module is designed for bulk salt removal, the Ionpure VNX-Si module for maximum silica removal, and the Ionpure VNX-CDIT module for high TDS reject recovery. The products are designed for industrial, power generation, pharmaceutical, high purity, and reject water recovery applications. Ionpure ED-R electrodialysis modules are designed with self-cleaning, polarity reversal capability. A single module treats up to 5 gpm (1.1 m3/h) RO reject, while removing over 50% of total ionised solids with up to overall 97% water recovery. Since the Ionpure ED-R systems do not require crystallisers or calcium sulfate precipitators to concentrate the RO reject water, there is no need for solid waste handling or removal, and they require less space and use less energy than the alternatives. The VNX-Si continuous electrodeionisation (CEDI) module is engineered specifically to remove dissolved silica from the reject stream. It is recommended for applications having in excess of 20 ppm and up to 80 ppm SiO2 in the RO reject. Performance is optimised to treat RO reject water with TDS levels up to 750 ppm as sodium chloride (conductivity up to 1500 µS/cm). As with all Ionpure CEDI modules, no regeneration chemicals are required as part of the demineralisation process. 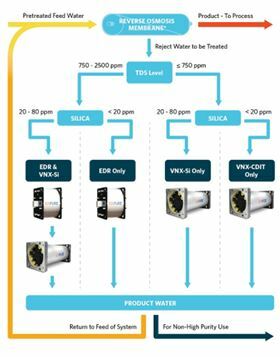 In a typical recovery situation, a VNX-Si module will follow an ED-R stage, producing a low mineral content, low silica water stream. The partially purified product may then be returned either to the RO feed, to a feed water holding tank, or sent for direct use to other parts of the facility. The VNX-CDIT module uses thin cell CEDI technology for outstanding high purity performance in high hardness, high TDS and high silica applications. It is also suitable for feed water with TDS levels up to 750 ppm as sodium chloride and recommended for applications where conductivity is less than 1500 µS/cm and silica is less than 20ppm. With a nominal flow rate of 30 gpm, VNX-CDIT modules can be configured to form systems with flow rates in excess of 1000 gpm. New modules are designed to deliver maximised pure water output while offering the potential to use fewer modules or to reduce system footprint.